I wasn't particularly fond of either of the whiskies going into this blend, so I ended up futzing around to see if there was a way to improve them. Maybe two wrongs would make a right. Nose: maritime, Juicy Fruit, purple sherry, floral, Laddie peat reek underneath becoming stronger with time, musty oak. After adding a few drops of water, it becomes creamier, the raisin notes become less sweet, some berries and new make grain pop out, something like lemongrass hand soap, and coffee/mocha. Taste: malt and sherry have blended almost seamlessly, a bit floral at the back, sour apples, very light peat and oak, sweet up front fading towards bittersweet at the back. After dilution, there is burnt sugar, bittersweet raisins, more sour apples or new make, and peppery honey. Enhhhh... while I think this is something of an improvement, the only real plus was bringing out more maritime influence on the nose. For some reason the combination seemed even younger than either by itself and there was no getting around the Laddie's unpleasant peat reek. Water also helped a bit, but the hand soap notes on the nose were not particularly welcome. So be it. They can't all be winners. I visited the Jura Distillery on my trip to Scotland last year, but was unfortunately unwell and unable to try any of their whisky. So I've been meaning to give it a go since then. When last I was at the Heathman Hotel bar, I noticed a bottle of their basic 10 Year on the shelve and decided to try a dram. The 10 Year is made from entirely ex-bourbon cask whisky which is then cut down to 43%. I am going to assume that it is chill filtered and colored, given that there are no statements to the contrary. Nose: malt-focused, slightly farm-y, vegetal, caramel, orange juice, mild oak, brown sugar. After adding a few drops of water, it becomes softer, the new make integrates better, vague fruitiness (apples/berries? ), and bourbon-y corn comes out. Taste: sweet caramel and malt up front, becoming grainy in the middle, then oddly bitter with new make notes at the back, barrel char throughout. After dilution, it becomes thinner but much creamier, the bitterness is stronger and more expansive, and some vague apple fruitiness comes out. Now I understand why Jura's basic expression doesn't get a lot of love. There is simply nothing here that I can find to recommend this whisky. The body is extremely thin (and I have had whiskies that were good at 40% or lower, so it's not just the bottling proof). The spirit seems rather immature, with a lot of residual new make character, even after ten years in oak. And fundamentally, it just doesn't seem to hang together very well. The elements clash rather than harmonizing with each other. While I have heard better things about some of their other expressions, I am going to be giving this one a wide berth from now on. 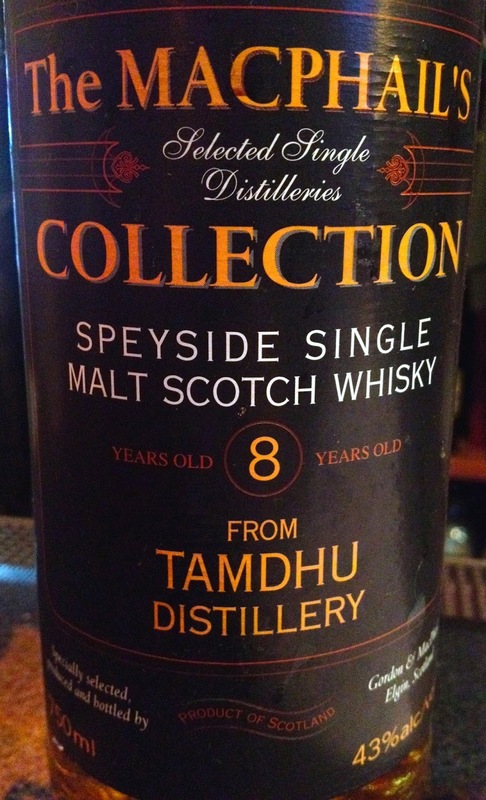 This whisky was released in 2011 to honor their master distiller, Douglas Campbell. 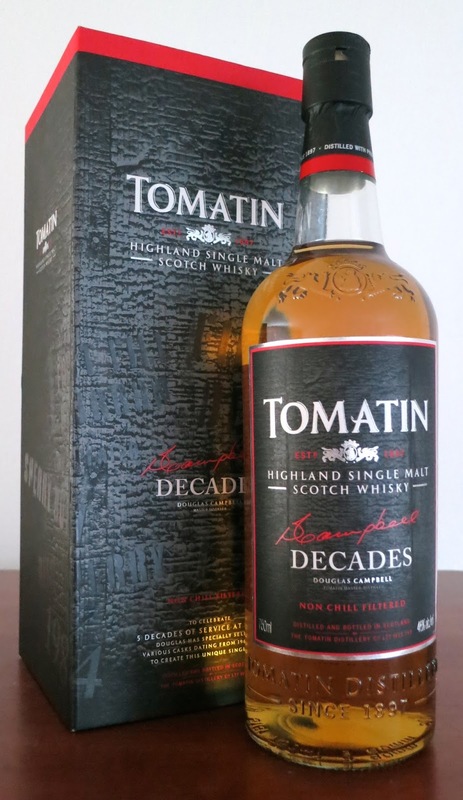 He had been working at Tomatin in various capacities for over fifty years, so the concept was to meld together casks from each decade he had been part of the distillery. All of the whisky going into this expression is unpeated, except for the 2005, which is lightly peated. After being married together, the whisky was reduced to a quite respectable 46%, without coloring or chill filtration. Nose: old, dank sherry, slightly tired bourbon casks, caramel, tropical fruits (grilled pineapple, mango), berry jam, grapes, bubblegum, vegetal notes, floral perfume (slightly earthy), sweet vanilla, underlying malt, a whiff of peat. After adding a few drops of water, a lot of honey comes out and the bourbon barrel notes are emphasized, the sherry and floral perfume integrate, the berries take over from the tropical fruits, some graham cracker notes come out, and overall it becomes much creamier. Taste: sweet malt overlaid with polished wood throughout, dank sherry underneath everything, bourbon cask vanilla and caramel, orange, pineapple, and mango mid-palate, segueing into young and old malt, mint overtones. After dilution, the bourbon barrel notes dominate the early palate alongside some honey and graham crackers, with the sherry coming in mid-palate, and the floral notes arriving much earlier. This is a very interesting malt at a shockingly good price considering the age of the casks going into it. It's mostly rather old whisky (even the 1990 casks were 21 years old when this was bottled) and it shows - there are a lot of similarities between this and the Duncan Taylor Benriach 34 Year I reviewed recently. Similarly, while I found this one very floral, other people are more likely to find Decades very fruity. Everyone responds to esters differently. As with many old whiskies, this one needs a lot of time and air to really hit its stride. When I first opened the bottle, the young peated whisky was dominating, with its less than pleasant new make character overwhelming the more delicate old whiskies. After a month or so, it really opened up and the peat and new make notes mostly faded into the background. More time in the glass after pouring it also helps to bring out the more nuanced elements as well. If you can still find a bottle, I would say this is a good whisky to pick up. Old whisky is getting rarer and rarer and this is an opportunity to try some old and lovely stuff at a reasonable price. Pot stills are one of the oldest methods on earth for concentrating the alcohol in fermented beverages (freeze distillation may have come first, but it's hard to know). In essence, a pot still is any system for boiling an alcoholic liquid, then directly condensing the vapors to generate a liquid with a higher alcohol concentration. While they all follow this basic model, there have been historical developments that improved on the basic setup over time. The simplest stills were literally pots, often earthenware, with a surface above it that would allow the vapors to condense and then run down into another vessel or a wide lip around the edge of the pot. As an open system, they were extremely inefficient as vapors could easily escape without condensing. Additionally, there was no easy way to remove heat from the condensing apparatus, which significantly reduced their efficiency. The first major development in design was the retort, which is a container, usually made of glass, with an arm extending off to the side, where the vapor would collect, (hopefully) condense, and then be drain in another vessel. Assuming good rates of condensation, this was a major step forward, but there was still no good way to remove heat from the arm of the vessel. An adaptation of the retort was to extend the side arm into a coil, which would then be immersed in a container of water, called a worm tub. The high heat capacity of water gives it a great ability to absorb heat from the condensing vapor, which made these stills much more efficient. Some industrial stills use roughly this same design, though the worm tub has water piped through it to maintain a constant cooling bath. While possible to construct a worm tub condenser from glass, those tend to be very delicate. So they were generally made from copper, which was ductile, making it easy to work with, and stronger. The final development of the pot still came from the addition of the column or shell condenser. This is a large tube with numerous copper pipes running through it that carry cooling water. This is the most efficient cooling system for pot stills and is now the primary condensation method. The simplest form of distillation when spirits are produced is as a wash still or beer still, which operates largely to concentrate the alcoholic portion of the fermented liquid being distilled. A lot of chemistry goes on as well, but here we're going to focus on the physical process of distillation. The wash still will convert wash at 5-8% ABV into 'low wines' at an average strength of ~25% ABV, which thus concentrates the liquid 3-4X, which a concomitant decrease in volume. Additionally, any compounds with boiling points significantly above that of water will be left behind in the pot, along with any residual solids that made it through the filtration of the mash or that were produced during distillation (especially when heat is supplied by a naked flame rather than by steam coils). You can see from the phase diagram above that when 8% ABV wash is heated to its boiling point of 94.5º C, it vaporizes, then recondenses to a liquid of 45% ABV. Distillation proceeds as the temperature rises, the ABV of the wash decreases, and the concentration of alcohol in the condenser approaches zero. In the other direction you should note the point where the vapor and liquid lines meet, which is the point when ethanol and water form an azeotrope - a mixture that has a single boiling point. This is why ethanol cannot be distilled above 95.5% ABV. So what's really going on? At a basic level, the purpose of any distillation is to separate different compounds by their boiling points. The components with lower boiling points will vaporize first, then so on down to the highest boiling components. The separation between different compounds is described technically as resolution. In double (or triple) distillation setups, this is carried out in a second pot still called a low wines or spirit still. Let's consider two cases. In each diagram, the X-axis represents temperature (or time, it doesn't matter too much if you assume a flow of heat into the system), while the Y-axis represents the concentration of each compound as measured at the condenser. First, you have a mixture of two liquids with almost exactly the same boiling point. When you heat the mixture, both will vaporize at roughly the same time and the concentration of each compound in the condenser over time will rise and fall in tandem. Next a mixture of two liquids with moderately different boiling points. The liquid with the lower boiling point (in red) will begin to vaporize first, with the output of the condenser consisting entirely of the lower boiling liquid at first. As time goes on and more heat is added to the system, the liquid with the higher boiling point (in blue) will begin to vaporize, with the output of the condenser consisting of a mixture of the two. As more heat is added, the compound with the lower boiling point will have been almost entirely removed from the pot, so the output of the condenser will be almost all the higher boiling liquid. Last, a mixture of two liquids with very different boiling points. This case will be very similar to the last one, but the period where both liquids are coming out of the condenser will be much smaller. 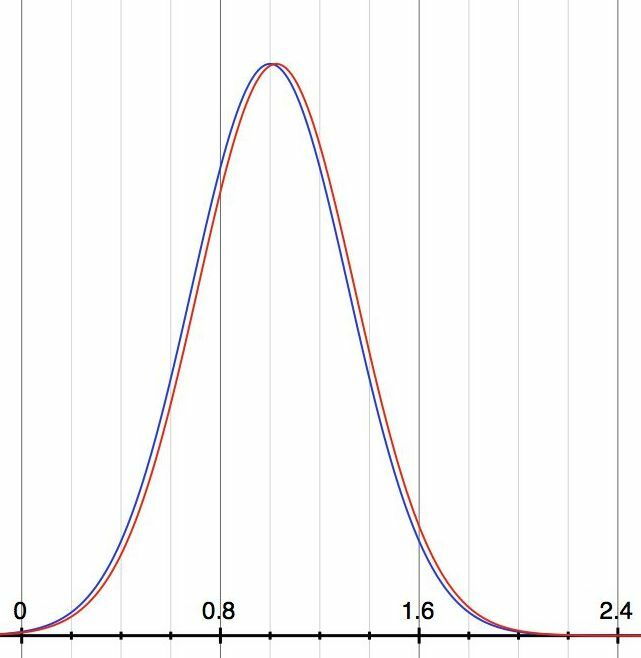 This is the resolution that I talked about earlier - the greater difference in boiling points increases the separation between the two peaks, making it easier to 'resolve' one from the other. Now obviously even the simplest distilled spirits are a much more complicated case, as there are hundreds if not thousands of different compounds that are going through the same vaporization-condensation process alongside the main constituents - water and alcohol. 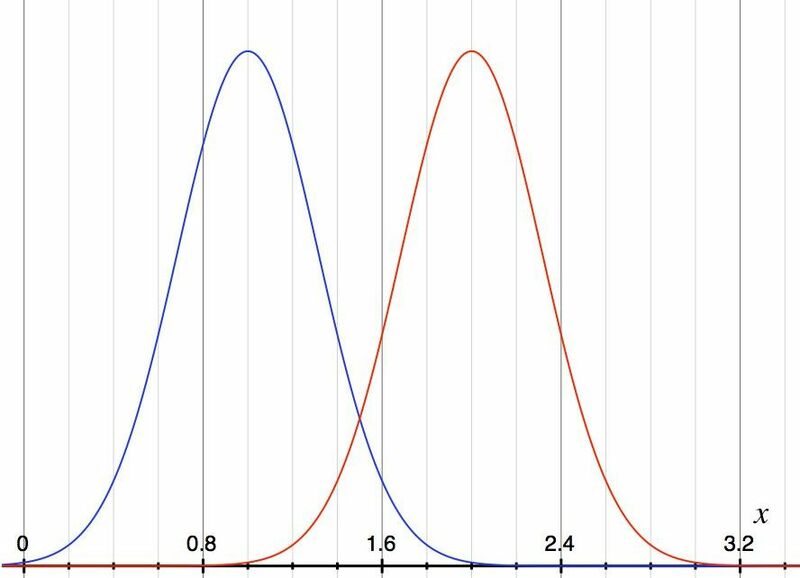 But the principles remain the same, you just have to imagine almost countless overlapping distributions. 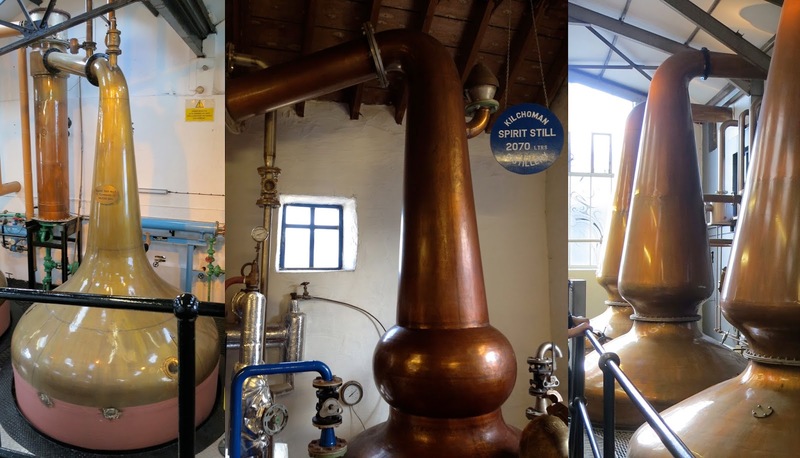 There are a number of different ways to influence the resolution in a pot still. One is the rate of heating the contents of the pot. This is described by distillers as running the stills 'fast' or 'slow'. Adding heat quickly will cause more compounds to vaporize at the same time. In contrast, slow heating will have the opposite effect, as the temperature rises slowly and low boiling compounds can vaporize and enter the condenser before the pot becomes hot enough to vaporize the high boiling components. The second major component of resolution is the amount of reflux in a still. Put simply, reflux is the tendency of vapors to recondense before reaching the condenser, which makes them fall back into the pot, where they can be reheated and vaporize again. This usually happens because the vapors contact the material of the still and transfer some of their heat to it, which removes that heat from the vapor and reduces its temperature. This forces the higher boiling components to go through the kind of separation described above again and again, significantly increasing the resolution. On a more macro level, this also affects the strength of the spirit that can be obtained in a single distillation, as a greater degree of reflux allows for greater separation between alcohol and water, producing a spirit of a higher strength. The above diagram shows the equilibrium curve between liquid and vapor mixtures of ethanol and water. This is a different way to visualize the temperature:concentration phase diagram shown above. This chart assumes that the temperature is at the boiling point for a given mixture, then displays the relationship between the concentration of ethanol in the liquid and vapor phases. The hashed line is where the liquid and vapor phases have equal concentrations. 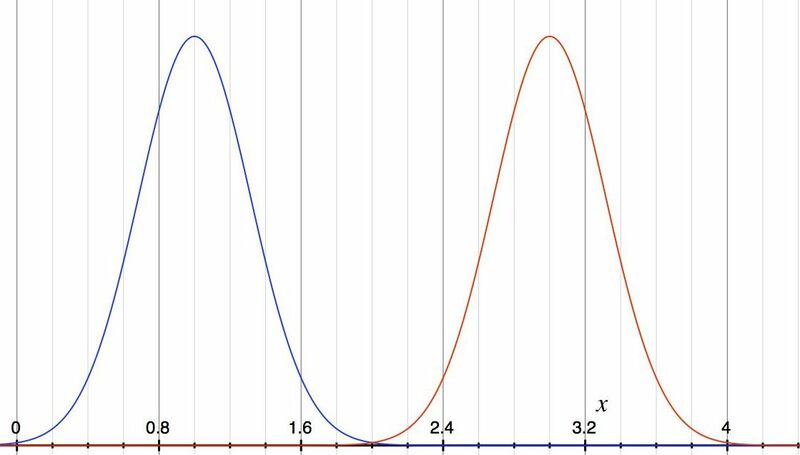 Drawing a vertical line from the starting concentration in the liquid up to the equilibrium line gives the maximum concentration that will be achieved in the vapor phase. A horizontal line would be drawn from that point going to the equal liquid/vapor concentration line in an ideal case where there is 100% reflux and everything coming out of the condenser is returned to the pot, which results in the liquid and vapor phases establishing a stable equilibrium. But in the case of an operating still, where mass is removed from the condenser and the system is not in perfect equilibrium, as represented by the lower solid curve (not actual data, but suggestive of a normal pot still), the liquid in the condenser will have a slightly lower maximum proof, so the horizontal line is drawn to the curve rather than the dashed equality line. This procedure is repeated as the mixture is repeatedly distilled, up to the point where ethanol and water become an azeotrope. This kind of analysis can thus tell you how many distillations will be required to reach a particular maximum strength. This is why double distillation usually reaches a maximum of ~70% ABV, but triple distillation can reach ~80% ABV. The amount of reflux is primarily dependent on the shape of the still. The simplest factor is still height - the shorter the vertical distance between the pot and the lyne arm that leads to the condenser, the less reflux there will be. Conversely, the taller the still, the more reflux. Next, the smaller the neck of the still, the more reflux, as this increases the surface area:volume ratio of the neck of the still, increasing the likelihood that vapor will come in contact with the material of the still. Conversely, a wider neck will decrease the amount of reflux, as there are more paths for the vapor to travel that do not bring it in contact with the material of the still, increasing the likelihood that it will reach the condenser as vapor. The angle of the lyne arm influences reflux as well - a lyne arm that is roughly at a 90º angle from the neck is considered to be neutral as vapors that condense inside the neck can run either back into the pot or forward into the condenser. A lyne arm that has an angle greater than 90º, rising from the neck, will increase the amount of reflux as it effectively raises the height of the still and vapors that condense inside the neck will run back down into the pot. A lyne arm that has an angle less than 90º, descending from the neck, will decrease the amount of reflux as vapors that condense inside it will tend to run into the condenser, instead of back into the pot. Last, but not least, the amount of reflux can be increased by creating constrictions and bulges in the neck of the still. This exploits the properties of gases as they are compressed and expand. As the vapors emerge from the constriction, they will expand experience a corresponding decrease in temperature, which will increase the amount of reflux. So a still with a ball or lamp glass shape will have more reflux than a still with a plain neck. Another trick to increase reflux is to run a pipe from the lyne arm back into the pot, which will return any material that condenses in the lyne arm for redistillation. We can see two extremes. First, Glenmorangie's spirit stills, which are very tall and narrow, with a ball shape, and rising lyne arms, which are designed to produce an extremely refined spirit with low congener content. Second, Lagavulin's stills, which are short and squat, with a plain shape and steeply descending lyne arms, which are designed to produce very heavy spirit with an extremely high congener content. It is in the second distillation that the concept of 'cuts' comes in. While different compounds are hitting the condenser at different times, they will all be collected unless the output is diverted into different receptacles. Most of those early peaks are things that you do not want to be drinking, like methanol, acetaldehyde, and other toxic compounds. So the person running the still will send some of the early output, known as foreshots, to the 'feints receiver'. Visually this can be thought of as making a vertical slice through one of the peaks - everything before goes to one place, everything after elsewhere. What comes next is the 'heart' of the run, usually running between 70% and 60% ABV, which contains the bulk of the alcohol and congeners that make the spirit taste good. As alcohol concentrations drop, water concentrations rise, and other higher boiling congeners that are also undesirable begin to hit the condenser. A second 'cut' is made at this point, sending the 'tails' or feints into the feints receiver as well. That should cover most of the basics. If you have any more questions, feel free to ask them in the comments and I'll do my best to answer them. While I feel like this idea has been discussed before, with tales of shortages and projections of exponential growth in sales and prices on the rise, it seems worth emphasizing again. It wasn't so long ago, say the early 2000s, that whisk(e)y was still far below the radar. The 1980s and 1990s had seen a rash of closures and sales of distilleries across Kentucky and Scotland, with the latter hit particularly hard. To put it in perspective, something like 20% of the distilleries in Scotland were closed or mothballed during the 80s and 90s, a huge decrease in capacity. In Kentucky, there were also numerous closures, with consolidation into only a few hands (Jim Beam, Brown-Forman, Heaven Hill, Four Roses, Buffalo Trace, Maker's Mark, and Wild Turkey). While production was scaled back, often drastically at many distilleries, most were still putting new make spirit in barrels and casks, which then proceeded to sit in their warehouses. This was on top of old stock that had been made in the 1970s and even 1960s, which had been produced when sales figures were much more robust (Mad Men, remember?). This meant that by the time the 2000s rolled around, most distilleries were sitting on a lot of very, very old stock. As most distilleries had at least some sales, they were dumping this older than usual whisk(e)y into even their entry-level offerings. Take, for instance, Ardbeg. I've written extensively about their situation before, so I will only summarize here. When the distillery was reopened in 1997, most of their stock was from 1983 or earlier. So the 17 Year and even 10 Year bottles contained whisky that was much older than the number on the bottle. The vaunted Uigeadail, which was first released in 2003, did not come with an age statement and included sherry casks from the 1970s. They made due with what they had and that meant you could buy extremely good whisky for next to nothing. While not always as extreme, this was true of many different bottlings of bourbon and scotch that were on shelves in the early 2000s. Supply grossly exceeded demand, so even the bottom shelf was surprisingly good. Fast-forward a few years. The wine and craft beer movements are firmly established. The cocktail renaissance is beginning to flower and people are once again paying attention to spirits that have been out of fashion for decades. Gin is gaining in popularity, if not quite supplanting vodka. Bourbon and rye begin to creep back into consciousness, as Manhattans and Old Fashioneds become fashionable again. Overall, people are thinking about what they drink and considering flavor and quality, instead of simply the ability to get them drunk. When it comes to whiskey, the bartenders reintroducing classic cocktails have an almost embarrassment of riches. Bourbons and ryes are old and richly flavored, with Bottled in Bond expressions like Old Grand Dad and Rittenhouse providing excellent counterpoints to the recently reintroduced flavors of vermouths like Punt e Mes or almost forgotten ingredients like Chartreuse. It didn't take too long before drinkers realized that many of the whisk(e)ys on offer were quite good on their own, as well as in cocktails. Exceptional spirits could be had for next to nothing. Bourbons with whiskey that had been aging for a dozen years or more, almost an eternity in sultry Kentucky, could be had for less than $20. Van Winkle bourbons from the shuttered Stizel-Weller distillery were significantly more expensive, running well over $40 - a fortune at the time. Scotch whiskies at 12 years old and over were regularly selling for $20-30, with even older expressions available for little more. Hyper-aged whiskies, at 25+ years old could be had for not much over $100. This is the world that precipitated the current boom. As blogs and forums where people discussed spirits began to proliferate, word that whisk(e)y was both good and cheap continued to filter into public discussion. Sensing a shift in attitude, distillers began to offer more esoteric expressions catering to the connoisseur, like Buffalo Trace's Antique Collection or Balvenie's wood and barley experiments. These helped to spark more interest, as they were often very good and frequently stellar, usually without costing an arm and a leg. Those with the right connections and a bit of cash could pick their own casks for bottling from the treasure-trove of slumbering whisky in the rickhouses of Kentucky and warehouses of Scotland. Legendary casks like LeNell's Redhook ryes, the KBD Vintage ryes, Willett's Iron Fist, or the Seelbach Hotel's Rathskeller rye were bottled by those in the know who were ahead of the curve. And all of these 20+ year old ryes were so cheap, even circa 2009, that it wasn't unreasonable to talk about making Old Fashioneds with them. In Scotland, now stratospherically expensive single malts from Port Ellen and Brora could be had for a song, because these were shuttered distilleries that had been mainly producing for blends, so no one had given the casks a second thought. This led to bottlings like those for the PLOWED Society, such as Brorageddon and Ardbegeddon that are some of the mostly highly rated whiskies of all time. This was also broadly true of other 'lost distilleries' that are now highly sought after as the remaining stock grows older and rarer. Fast-forward again to around 2012. Bourbon, rye, and scotch are now firmly in the mainstream and demand is rising exponentially. Old rye is becoming a thing of the past, with Heaven Hill struggling to meet demand for the roughly 4 year old Rittenhouse Bonded. Special releases like the Antique Collection are getting harder to find, as collectors and bars snap up most of the allocations. Port Ellens and Broras have passed out of reach of many if not most drinkers, though a few independent bottlers still put out something affordable here and there. While many established brands still offer good prices on their entry-level expressions, prices are steadily rising for older whisk(e)y and new expressions are introduced at higher prices than before. More and more non-age statement releases are appearing on shelves, beginning to clog the field with youthful mystery and the distiller's injunction to 'trust us'. Now, a few years later, we are in full-on boom mode. New standard releases (Knob Creek Rye, Wild Turkey Forgiven, Larceny bourbon, the entire Bruichladdich lineup, etc.) rarely have age statements, despite the ever-increasing price tags. Almost every 'limited release' is snapped up and immediately resold on the secondary market, despite eBay and the Bourbon Exchange group on Facebook being shut down as resale channels. The prices paid on the secondary market have also worked their way through to retail prices as distillers try to capture more of the money that people are willing to pay. For example, the 2013 Diageo special releases included a Port Ellen at £1500 and a Lagavulin that clocked in at almost £2000. And every single bottle sold. Elijah Craig 18 Year used to sell for $50-60, but the new Elijah Craig 21 Year retails for about $130. There are stills some exceptions, such as the Buffalo Trace Antique Collection, but these are commensurately difficult to find at retail prices as resellers know the margins that can be obtained. How did we get from one state to the other? Booms and busts (with their associated gluts) almost invariably lead back to the other side. The bourbon and scotch whisky industries have gone through sinusoidal changes in business for more or less their entire history. The growth of blends in the late-19th century led to the massive closure of distilleries in the early 1900s as a result of the Pattison Crash. The huge expansion of distilleries in Campbeltown eventually led to poor quality that meant few survived the tanking demand during Prohibition. The post-Prohibition demand for bourbon eventually led to its collapse in the 1970s, as distillers watered-down and thinned their product with neutral spirit in a downward spiral of 'lightness' in an effort to compete with more fashionable vodka. Eventually they bounce back as gluts allow them to build up better products and the cycle of fashion comes around again. Whisk(e)y has ridden the recent wave of interest in 'vintage' products, whether it be clothes, vinyl records, or the cocktails of previous generations. The sense of whisk(e)y as being more 'authentic' than, say, flavored vodkas has been an important component of the upswing. Bourbon, scotch, and rye all have deep histories with associated stories that can provide a compelling interest in the product. The veracity of those stories is often mixed at best (Templeton rye, for instance), but that doesn't stop people from enjoying them. The sense of authenticity was bolstered by the fact that in the earlier phases of the boom, whisk(e)y was almost universally an excellent product. As I noted above, old stocks were being dumped into even bargain expressions. It's easier to believe the claims about a spirit being 'hand crafted' by distillers with deep history when what you're drinking is really, really good. The question is whether that esteem can be maintained as old stocks are run down and distillers are increasingly putting out whisk(e)ys of increasing youth and dubious quality at higher prices. Interest and excitement about whisk(e)y is currently propped up by the limited supply of older casks. Few distilleries foresaw this kind of interest in their products a decade ago, let alone twenty years ago, so expressions that requite older whisky are often genuinely limited. Instead of leaving money on the table, many distillers are responding by dropping age statements and using other markers of quality to convince customers of the quality of their products. While there are plenty of claims that 'age doesn't matter', there really is no substitution for time in the cask. This is most visible in Macallan's current lineup, with younger and cheaper whiskies being offered without age statements while the older and more expensive whiskies that are 18+ years old firmly retain them. While there are arguments that new drinkers will establish different tastes as the current offerings become the norm or, more cynically, that people will drink whatever is on offer, I don't believe that taste is quite that subjective. Coupled to the fact that tastes and fashions change, whisk(e)y is not limited in its production capacity in the same way that fine wines or cognac are. While a few distillers will create whisk(e)ys specifically from local grains, they can ultimately come from just about anywhere on the globe. While barley crops have occasionally done poorly in recent years, increasing demand should encourage farmers to grow more, which will eventually bring supply in line with demand for whisk(e)y's raw material. A few distilleries, such as Oban, are genuinely limited in how much they can expand, but capacity is being built at a furious pace in Scotland and America right now. Buffalo Trace is putting $70 million into new warehouses and expansion of the 1792 distillery in Bardstown. Brown-Forman is pumping $100 million into Jack Daniels. Jim Beam is investing $28 million in expanding their own facilities. Diageo is spending roughly £1 billion in new distilleries and facilities in Scotland - the Roseisle project that opened a few years ago was £40 million, the Mortlach clone will run into the millions of pounds, and another mega-distillery costing £50 million is being sited next to the existing Teaninich distillery, which itself is getting £12 million worth of upgrades, £30 million will be fed into Clynelish, in addition to roughly £40 million spread across their other distilleries in Speyside. Pernod is building a mega-distillery on the site of the former Imperial distillery, which will expand their malt whisky capacity by 10%. This is in addition to reopening the mothballed Glen Keith distillery and expanding its other Speyside distilleries. Eddrington is planning to spend £100 million building a newer and bigger version of Macallan, while mothballing the old distillery on the off-chance that it needs even more capacity. All of this implies that America and Scotland's already vast capacity to produce spirit will be growing geometrically over the coming 5-10 years, with whisk(e)y ready to be bottled as entry-level bourbons and blended whisky only three years after the new facilities make their first drops. All of that is to say that while demand may continue to exceed supply for older whisk(e)ys for some time, there will never, ever be a time when you are unable to find some kind of brown spirit on liquor store shelves. The turnaround time for basic bourbon and blended whisky is so short that supply will likely outstrip demand first. Which, of course, sets up the conditions for the next glut. With capacity increasing wildly and the quality of what's on the shelf decreasing, it may not take all that much longer for demand to start faltering. Without the spectacular offerings of even a few years ago to buoy interest, the plaudits may not come as thick as they have been recently. Many customers may be priced out, with the price of entry-level single malts approaching the $50-60 range while real wages in many developed countries remain stagnant or continue falling. Without refined spirits, connoisseurship will not have as much to work with. People may decide that it's cheaper and easier to drink unaged sprits if their primary goal is getting drunk. The secondary market, which has done a lot to drive up prices on the higher end and encourage the spread of 'limited editions' may eventually pop, as it has all the hallmarks of a bubble, with people 'investing' on the expectation of prices rising simply because they have been rising for as long as they have been paying attention. More broadly, the economic rise of China, India, and Brazil that has fueled much of the demand for aged spirits may falter as they become mired in the middle income trap. Just as the demand of today was impossible to forecast 10-20 years ago, assuming that todays conditions will continue unabated is just as iffy. The indicator to watch is whether the planned expansions actually go forward. With the exception of Roseisle, most if not all are in the planning stage, with little to nothing done as yet. If trends hold and the money is actually invested, then the owners clearly expect the new plant to be necessary to keep up with demand. But if these plans end up being quietly shelved, then even the people at the top see the boom ending sooner rather than later. Ultimately, I'm just speculating. Aged spirits are a very peculiar industry, where it is extremely difficult to match supply with demand, no matter which way each variable is going. But the claim that "this time is different" had been made about countless situations over the centuries and rarely is it ever true. The whisk(e)y industry has always been a creature of boom and bust and I lean towards the opinion that it will continue to be so. Gordon & Macphail bottle a number of young single malts under their Collection moniker. I've previously tried the Highland Park, which made me interested to try some of the others. I got a chance the last time I swung by the Highland Stillhouse for a drink. G&M purchases new make spirit directly from the distillery. This version was made from whisky aged exclusively in refill sherry casks for at least 8 years, then bottled at 43%. No word on chill filtration or color, so I'm going to guess that both are in use here. This expression has been reformulated recently and is now a mix of refill bourbon and sherry casks. Nose: burnt sugar and orange peel, sherry, malty, vanilla, light apple notes. After adding a few drops of water, the burnt sugar becomes maple syrup, the sherry tucks inside, and it becomes grainier and more vegetal. Taste: sweet & sour throughout, lots of creamy malt mixed with sherry and wood at the back, bourbon barrel fruit. After dilution, there is more malt sweetness, the sourness tones down, it is more grain-focused with less sherry and oak, it feels younger, and some citrus notes show up. This is a malt with no pretensions of being anything other than what it is: a moderately sherried, young Speysider at a price that positions it to compete with blends. There's little in the way of complexity and its youth still shows, but there's nothing off-putting about it either. If you're a blend drinker looking to move into single malts or a single malt drinker looking for something that isn't such a hit to the wallet, I would highly recommend grabbing a bottle.